Clinical staff spend much of their time working within the EHR application. 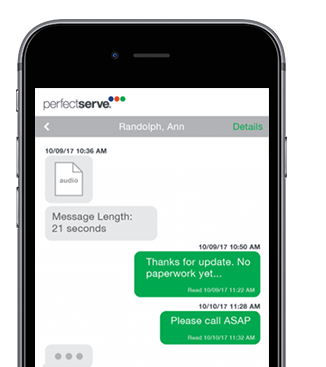 By embedding PerfectServe’s messaging capabilities within the EHR, your staff can use PerfectServe for messaging and stay in the EHR to keep working. This supports a more seamless workflow for clinicians. Contact your PerfectServe representative for more details about adding on the EHR integration inpatient software service to your license. Dynamic Intelligent Routing® removes the stress of time-wasting inefficiencies. No more tracking down the right physician. No more searching for the right care team member. No more missed calls or delayed messages. No more unwelcome interruptions. Enables clinicians to connect across all care settings. Provides the communications infrastructure needed to support value-based care. PerfectServe® offers the industry’s broadest integrated suite of inpatient and outpatient applications that can scale across your entire enterprise. PerfectServe protects physician and other practitioners’ time by ensuring that only the communications that are relevant to them and require their action are received, so they are not bombarded by erroneous and immaterial phone calls and messages from colleagues and care team members. Further, PerfectServe eliminates unnecessary interruptions, lost and delayed messages; facilitates more direct connection collaboration among physician colleagues and team-based care members; enables more efficient care coordination under alternate/episode-based (bundles, MACRA) payment models; and enhances the quality of care by enabling your physicians to speed time to treatment. PerfectServe facilitates interdisciplinary collaboration among all care team members, across all care settings, because it provides nurses with the ability to easily identify and immediately connect with the right person for any given clinical situation. By eliminating the non-value-add activity associated with searching for whom to contact and how to do so, extended waiting for returned pages/calls and erroneously calling the wrong physician or other care team members, PerfectServe is able to ease the workload of the nurse and increase care team efficiency and productivity. Consequently, PerfectServe is proven to reduce communication cycle times resulting in eliminated care delays, faster care response time, decreased patient wait time, enhanced patient experience, expedited patient transitions and increased direct care time. Only PerfectServe provides a single, secure unified communication architecture purpose-built to transcend geographic and organizational barriers to drive collaboration across all stakeholders (including the patient) across all care settings, inpatient, outpatient and post-acute facilities. Only PerfectServe can address more needs and problems across every area of care and stakeholder group while simplifying and standardizing communication applications, technologies and vendors; ensure high adoption to increase HIPAA compliance; support of a flexible mobile device strategy across any modality (e.g., secure text, voice call, voice message, pager, mobile app and web app; and deliver products as a hosted service without on-site hardware or software and required associated maintenance. PerfectServe has two core escalation capabilities. First, notification escalation processes can notify the recipient of unacknowledged messages, and can be sent to multiple devices or end points simultaneously or in succession. Second, PerfectServe provides a backup escalation process to copy messages to other users if unacknowledged by previous recipients within a designated time frame. PerfectServe also has the ability to hold messages for future delivery. Discover the right clinical communication solution for your health system.